The John McGivney Children's Centre (JMCC) is located at 3945 Matchette Road in Windsor ON. Our business hours are Monday to Friday, 9 a.m. to 5 p.m. This page is designed to provide you with general information about visiting the Centre. There is free, accessible parking available for families and visitors in front of our main entrance. JMCC is open Monday through Friday from 8 a.m. to 5 p.m. When you first arrive at JMCC you must check in with the receptionist. You will be asked to sign the visitor log and you will receive a visitor badge. All visitors to JMCC are required to wear a visitor badge throughout their visit. In consideration for others, we request that you do not wear any scents when coming to the Centre. Strong scented products such as perfume, cologne, aftershave and hairspray can cause or trigger health issues. 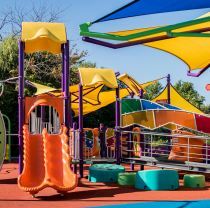 Our accessible playground is open to the public and is open outside of our business hours, including both evenings and weekends. Play McGivney is the perfect place for family fun for all ages and abilities! Still have questions about visiting JMCC? Please feel free to give us a call at 519:252-7281.